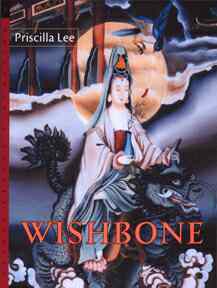 A fascinating, eclectic mix of tongue-in-check laughter and heartbreak, Wishbone is a reflection on life, at first seen through the eyes of a child forced to grow up before her time, and later, by a woman facing her past. 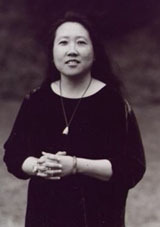 These courageous poems chronicle the life of an Asian American woman at the crossroad of two cultures, transforming her conflicting experiences into self-acceptance, strength, and a wild, free, happiness. the way you judge your mother. sheets at least twice a week. with ice cream made of green tea. You and I share a hunger for this perverse world. turnips in brine. The force of creation is not passive. dances like a flame, he may want a taste. while I watch? That’s how I talk to my honey. Other times, I tell friends my wife wants two men. that lets us look into the secrets of others. & thank El Nino for the pulsing hillsides. that shimmers back at you. carried up from a cool cellar. Broil the eggplant inches from the heat. leaving walls thick enough to hold. & pomegranate seeds. Pack a basket. down to the beach. Don’t hurry. savor the soft succulent meat. Dig your toes into the sand. onto the blanket while he nibbles. if you are not feeling particularly angst-ridden. In a large bowl, thrash butter and sugars until uniform. Add flour and baking soda; whip until smooth. Toss in chocolate chunks and nuts. refrigerate the cookie dough for a couple of hours before baking. baking sheet–aim so that the cookies land 2 inches apart. and allow them to vent on wire racks. tight as a crinkled mouth. into the edges of a room.